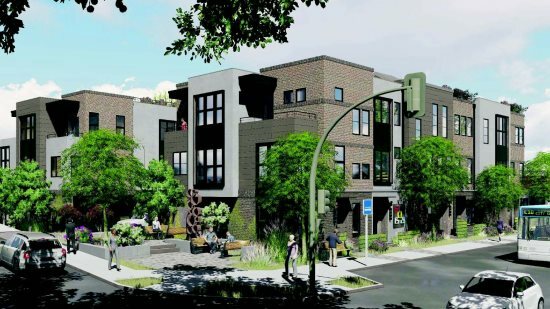 The Lafayette City Council has approved the development of 13 condominiums in two, three-story buildings with two below-market rate units on the corner of Mt. Diablo Boulevard and Brown Avenue, replacing the existing structure currently used as an auto repair shop. City council review was required in this instance because the project requested concessions and waivers under city and state density bonus law. The vote at the March 25 meeting was 4-1, with Council Member Susan Candell voting against the motion to adopt the resolution subject to modified conditions finding the project exempt from the California Environmental Quality Act. The council heard from Stefan Schnitzler of Branagh Construction who, along with architect Scott Thomsen from Left Coast Architecture, gave details of modifications made to plans since their last appearance before the city two weeks ago. With tweaks made in the areas of on-street parking, moving laundry facilities into each unit, improvements to pathways, allowing enough egress and ingress for garbage pickup and slight changes in materials used to keep the more "rustic" nature of the neighborhood, Senior City Planner Payal Bhagat said that city staff recommended approving the project. 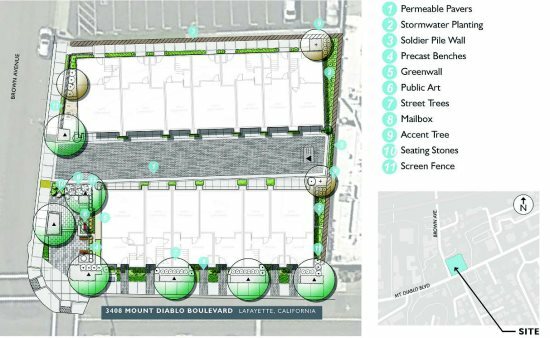 The project has prompted concern from residents who worry about increased traffic, lack of parking and who are not happy with the three stories in the design, many claiming it goes against the General Plan. Such concerns were voiced by several during public comment and were the subject of several letters from residents. Lafayette resident Deborah Callister had written, "It will set a bad precedent for building height on the east end of town, it eliminates commercial space - another bad precedent; it will do nothing to help provide much needed very-low or low-income housing in Lafayette; and we need to protect views of our green hills that we enjoy every day." 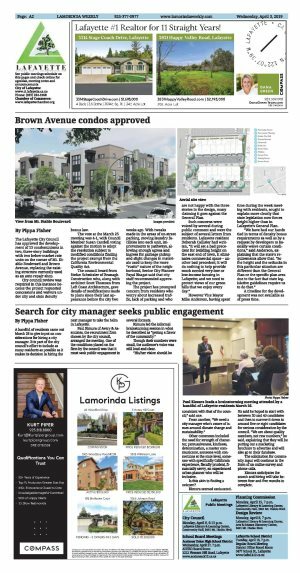 However Vice Mayor Mike Anderson, having spent time during the week meeting with residents, sought to explain more clearly that state legislation now forces height higher than in Lafayette's General Plan. "We have had our hands tied in terms of density bonus requirements as well as by a request by developers to basically waive certain conditions," said Anderson, explaining that the state's requirements allow that. "So the height and the setbacks in this particular situation are different than the General Plan or the specific plan area due to the fact that state legislative guidelines require us to do that." A timeline for the development was not available as of press time.